Ok, so its 2017 and motorcycle theft is on the rise. And whether you ride a supersport, adventure bike, enduro, cruiser or scooter is largely irrelevant as to whether the local bike vultures will attempt to relieve you of it. The most common forms of theft are still either lifting the bike into the back of a van or attempting to disable the immobiliser, getting the bike started and then riding it off under its own steam. We also know that bike jackings are being reported where the owner is physically removed from their bike with the key still in the ignition by a couple of thugs but thankfully these incidents are rarer. Its devastating however it happens so the aim of this guide is to better educate you on the types of motorcycle security available and how to use them effectively so you can make an informed choice. Yes, effective motorcycle theft prevention is an additional expense over and above the initial purchase price of your bike, the cost of insurance, fuel and protective gear but one that is necessary to prevent the theft of your pride and joy. Garage storage is always better so that your bike is kept off the road and out of sight from passers-by. The garage itself forms your first line of defence so the lock on the door should have an official security rating from a 3rd party organisation if it’s a padlock you’ve purchased yourself. If an integrated locking system, buy the best your garage door installer has to offer. If your garage door swings outwards from the bottom whilst opening, then a Garage Defender or similar product that sits on the ground and prevents the door from moving past it whilst in place is another great option. Inside you’re going to want a ground anchor fitted where you usually position your bike. These can be either floor or wall mounted but are recommended to be installed into a concrete base. 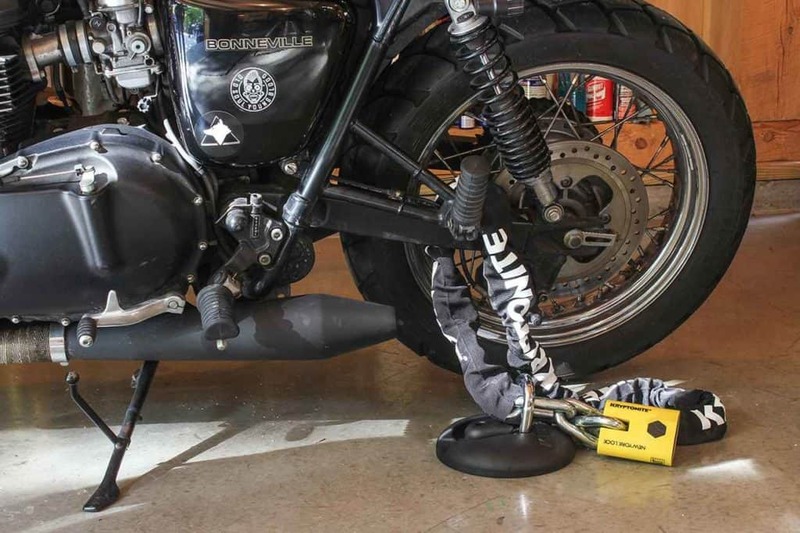 The objective is to provide an immovable tether point for your bike so that it can’t just be picked up or wheeled away. The next step is a large high strength steel security chain which you attach through your bike and then into the ground anchor’s shackle. Better yet, buy and use two. Most ground anchors have enough space to pull more than one chain through. The chain you use should be the best you can afford – the thicker the better to prevent bolt cutter attacks. The same goes for the padlock or D lock you choose to secure the setup with. The New York Legend is a great buy and comes with its own shrouded padlock with a 16mm steel shackle. Again, these products are often submitted to independent bodies and put through rigorous testing procedures to make sure they stand up to attack. Finally, investment in an alarmed disc lock is a smart move. 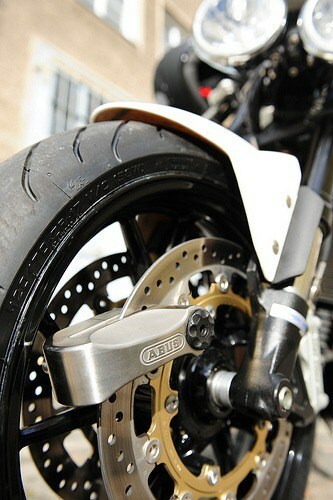 You attach them to the front or rear wheel (both is even better) which prevents the bikes wheels from fully rotating. They also provide an ear piercing siren as soon as any movement is detected which is inevitable. Any would be theft attempt will be cut short when they know they’ve been rumbled. Wheels can be removed so your chain(s) ideally need to be routed through your subframe. Once in place you need to then remove as much slack from the chain as possible so that it isn’t dangling on the floor. The reason for this is that floor provides a great leverage point for bolt cutter and hammer attacks. With the chain hanging in the air it will make their lives much more difficult to make any cuts. Then you’re pretty much done. With the right chain and lock, these alone will act as a major deterrent to any thief. And if they do go for it, nothing short of an angle grinder is going to allow them to make off with your bike. On that point, the best chains on the market are able to withstand an angle grinder’s cutting disk for an impressive amount of time. Portable angle grinders have a small battery life so unless the thief is carrying spares, he may well run out of juice. Cutting discs also lose their material pretty quickly up against hardened steel and we’ve seen discs break in the hands of those unable to use them properly and hold the disc steady in the cut they’ve made. We make sure our chains aren’t on the floor so hopefully any disc may just break and end up flying off into something soft and fleshy. When out and about, it’s a common misconception that a motorcycle’s steering lock alone will be enough to prevent it from being stolen. I’ve got bad news for you guys because it won’t. They can be broken in seconds if you know what you’re doing, leaving our thief easily able to wheel or ride it away. Still use them but don’t rely on them. What you want is enough of a deterrent to put off a thief completely or at least make your bike the hardest and riskiest to steal of the ones it is parked next to. Motorcycle thieves are becoming more brazen but if you can, park your bike in a busy public space so that at least onlookers have the opportunity to call the police if there is an attempted theft taking place. It is also always a good idea to secure your helmet too with a strong motorcycle helmet lock which can be fixed to your motorcycle. Like at home, you want your bike attached to an immovable object like a lamppost or other piece of street furniture if possible. This will prevent an easy lift and go job into the back of a van. Instead you want your thief to work for his meal ticket so you need to buy the thickest chain or cable lock you can conveniently carry around with you on your bike. The type suitable for home use are heavy so you might want to get another with the same security rating but which is a little more portable. These will usually need to be stored in your top case or any hard luggage you use. Some people even leave their chain on the ground in situ if it is somewhere you park frequently but we would prefer if you take it with you. It will save someone keeping an eye out for when your bike is next there. We would also suggest you carry at least one of the alarmed disc locks we advised you about above as an additional security step. These are usually able to fit under your seat depending on what you ride so you have no excuse not to have it with you. If someone so much as tries to move your bike, everyone in the vicinity will know about it. The better ones can’t be removed with bolt cutters so your thief is going to have to spend a long time with his portable angle grinder out, attracting attention with all the noise he’ll be making. The same as at home. Chain off the ground and in the air with it passed through the frame of your bike and not the wheels. Alarmed disc lock on one of the wheels, steering lock on and you’re good to go. The same principle applies if you use a motorcycle dolly within your garage. We’re sure that new methods of bike theft will be invented at some point but for now, this is the best way that you can prevent your bike from being stolen. Be smart and don’t become complacent. 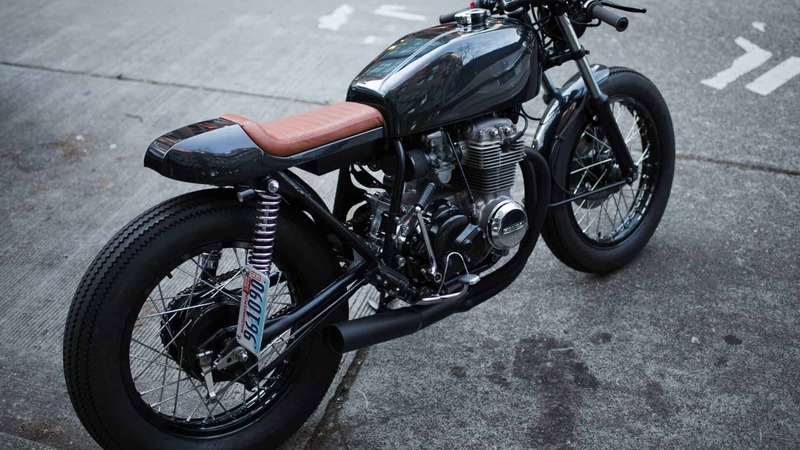 Motorcycle prices are on the rise so invest a little money and secure your motorcycle properly.